So far, in it’s short existence, the Vive has had an interesting selection of games. These games range from literally nauseating to impressive, but most have the feeling as a tech demo at this point. Many Vive games have a lot of style and gimmicks, but lack in actual gameplay or even fun for a stretch of times. While the horror genre and arcade style games have shown us some virtual reality gems, what are other some other types of games that are worth the time and money that the Vive or, any VR system require? 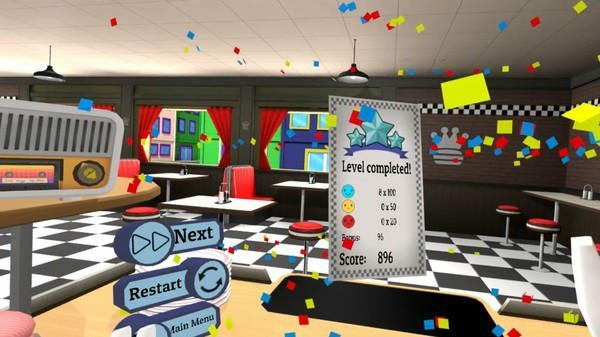 One of the more fun games I have played for the Vive recently is one called Diner Duo. Diner Duo is an asymmetrical multiplayer game by publisher, Whirlybird Games. The game’s concept is simple; you and your partner are running a diner and have to keep the customers happy and served the correct food and drink in a timely manner. You achieve this by having one person, using the VR headset, be the cook and the other person using a traditional keyboard and PC controls running around the diner, taking orders and serving food and drink. The game closely resembles a two player Diner Dash in both its concept and mechanics if you are playing as the server and loosely resembled the chef level of Job Simulator if you are the cook. You can unlock hats and other cosmetic customization. If you don’t have or want to play with a partner, there is also a single player mode where you can see if you have what it takes to be the top chef. I played single player and played the multiplayer with a partner and see if we had what it took to run a restaurant. As the chef, the controls were slightly clumsy and I tended to drop my fair share of food and it would occasionally take two or more attempt to grab the item I wanted.I also found it wasn’t obvious how to initiate some options, such as scaling the kitchen for the chef, but that didn’t inhibit the gameplay and could eventually be learned. I also noticed the table would knock ingredients out of your hands or the knife would get stuck while trying to cut cucumbers. While annoying, these quirks were not enough to stop playing and didn’t stop the fun. As the server, I found the gameplay to be smooth for the most part and fun. As someone who has played Diner Dash type games in the past, this was more of the same. It took a minute or two to get the hang of the controls, but once I did, the levels flew by and a rhythm was established and I found myself loudly, but efficiently communicating with my chef and making sure to keep customers happy with plenty of pie during more chaotic times. The only hiccup I experienced as server was that during more rushed and advanced levels, if I wasn’t paying attention, it would be very easy to pour the wrong drink or give the food to the wrong customer unintentionally, leaving a customer who had been waiting longer getting progressively angrier. Overall, this game is best experienced in multiplayer mode and is a much needed addition to the VR collection. The world of VR can be a lonely one, so more asymmetrical games are not only welcomed, but necessary in a library full of arcade or horror games. This game may not be the most complex and it has no narrative, much like so many VR games, but the multiplayer aspect it brings and the fun that comes with it makes it worth the money.